Whether you're aware of it, the path leading to your front door makes a first and lasting impression. 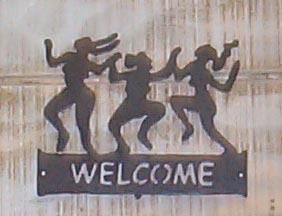 Do you have a welcome sign that invites your guests into your home? Does it convey your personal style? Each welcome sign is cut from steel and measures approximately 11 inches wide by 7 inches tall. Choose from the rust finish (shown) or blue heat finish (see finishes below). Welcome signs are made to withstand inclement weather. 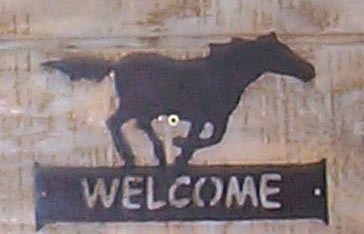 Each welcome sign come with screws to mount to your house. Buy a welcome sign that will make a lasting first impression. Reserve yours now.